We did a smoky whiskey cocktail with a sparkling twist! I’m bringing you another smoked cocktail that is deep in flavor and suited for those who like hearty cocktails. For this cocktail, I’ll be adding even a deeper flavor to the whiskey by cold smoking it with a handheld food smoker. A rich syrup is made first and then added to our cocktail that can be served hot or cold. Perfect, either way, to warm you up on cold winter days! To get our Harvest Smoke & Sparkle cocktail started, we need to make the sweet syrup to balance the boldness of the smoked whiskey. 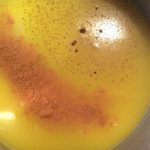 In a small saucepan over medium heat, whisk together ½ cup of honey, ¼ teaspoon ground ginger, ¼ teaspoon ground cinnamon, 1/8 teaspoon ground clove and 1 cup of orange juice until it starts to bubble. Remove from the heat and allow to cool. If making individual cocktails, it is important to still make the full batch of cider-honey syrup and take the 1 tablespoon plus 1 teaspoon of cider-honey syrup from the batch per cocktail. Tasting Notes: This is referred to as a harvest sparkle due to the traditional spices associated with the Fall. Feel free to experiment and adjust these flavors as cardamom and allspice also work well. With the cider-honey syrup made and cooling, it’s time to take your favorite brand of whiskey and cold smoke flavor into it. 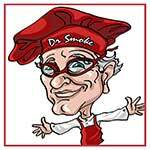 I’m using The Smoking Gun® by Breville which is self-standing to make the actual smoking process easy. 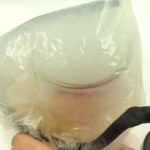 After placing the whiskey in a measuring cup, I place the measuring cup in a plastic bag and insert the hose of the smoking appliance into the bag. 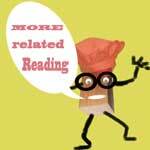 I then add a pinch of Piccolo® wood chips to the bowl and turn on the unit while lighting the chips. Once the smoke fills the bag, I shut off the unit, remove the hose, and cinch the bag closed to allow the smoke to penetrate the whiskey. It helps to move the whiskey around in the cup to help the smoke molecules to cling to the alcohol. That’s it! What is so great about this whiskey cocktail is that is can be served hot or cold. Today, I’m making the cold version in a large batch to serve many guests. I start by adding my smoked whiskey and cider-honey syrup to a large pitcher with lots of ice. Next, I whisk these two ingredients together well. If making a single cocktail, add an ounce of the smoked whiskey and 1 tablespoon plus 1 teaspoon of the cider-honey syrup to a shaker filled with ice. 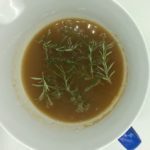 I strain into a serving glass and add Prosecco and a garnish of rosemary. I prefer a bit of ice in the glass for the cold version. Now, for those that like it hot, simply whisk together the smoked whiskey and cider honey syrup in a saucepan or heat in the microwave for 45 seconds in a mug. This is one smoked cocktail that will take away any chill in the air! Dr. 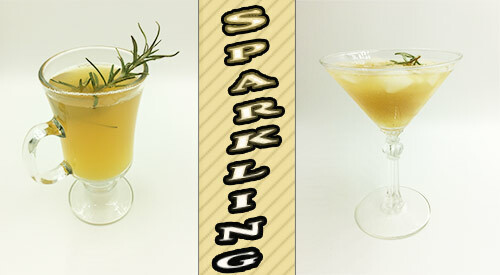 Smoke in this recipe we did a smoky whiskey and added sparkling wine!